After only a few visits, we can see that Dr. Horne's caring approach, clinical skills and friendly manner are more than enough to fill the shoes of the previous owner's of Clintonville Animal Hospital. I am truly thankful for all of Dr. Horne's time, care and compassion this last year. We were so lucky to find your as our vet just in time for all of the health challenges that old age can present. You were so very kind with your phone calls, listening and reassurance. When we adopt another dog in the future, we will surely seek your care! The veterinarian, Dr. Devon Horne, was absolutely wonderful. We ultimately had to put our kitty down, it was her time, but Devon and her staff made the process extremely smooth and were very patient as we said our final goodbyes. That meant the world to me since she was my first and only pet. Loved Dr. Horne!! She was so sweet taking care of my kitty! We went to quite a few vets but had a hard time finding one we felt comfortable with. This one was recommended to us by someone we know and it was close by, so we started taking our cats there for their shots and checkups. One cat fell suddenly and incredibly ill one weekend - horribly lethargic, not eating or drinking, huge lump on her neck - and we rushed her to one of the few places open late on a weekend. Our service there was initially friendly, and that's about the only good thing I can say about it. She showed no improvement following, and as soon as the week came, we called here. They managed to fit us in same day - a feat for this location - where they were patient and worked with us in our means. After x-rays, the vet took the time to show it to us and explain exactly why she thought the way she did about it. Something the other location did not do, and in fact, their findings were a little questionable. She showed improvement from her treatments there next day, and went on a steady incline. There is no doubt in my mind that my youngest cat would have died if not for their intervention, and now she is back to her normal self! This place is fabulous. 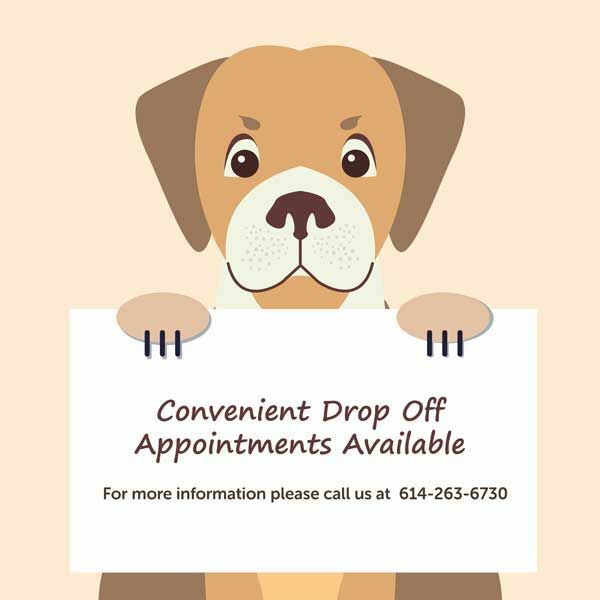 I'd been looking to switch vets and decided to try Clintonville Animal Hospital but I never got a chance to make my initial appointment. Yesterday, my male cat had an emergency situation. Even though we were not current patients, they squeezed me in and stayed past their closing time. The doctor sat with us for over an hour explaining the situation and our options. I never felt like she was suggesting unnecessary procedures or treatment. I left the office with very reasonably priced bill and confidence that my cats condition is manageable - which is something I never experienced at my other vet. I will be switching my bulldog and other cat over to Clintonville Animal Hospital ASAP. I take my dog here. The vets are a married couple and both are wonderful with my little Rupert. The vet techs are really loving to the animals. The cost is around 40 for a regular office visit, which isn't so bad, especially considering how well informed you are when you leave. Also, they have old New Yorkers in the waiting room! The magazine, not the people. At least not when I was there. I love this vet. I will never go anywhere else! Amazing! Should you take your pet there? YES! When I brought in a stray puppy that showed up at my house emaciated and sick with Parvo, they were very reasonable and fair in advising me how to approach treatment with my limited financial resources--they didn't think it seemed necessary to hospitalize him, so they had me bring him in daily for therapy and he survived and is doing well in a foster home. Now that was a good call! It was because of this experience that I take my own dog there now. She is a big pit bull mix who I haven't had for even a year yet, and I had been looking for a new vet after a bad experience with the first vet I took her to. She is a sweet but nervous dog who has never bitten but likes to show off and bark at strangers when she is scared, yet she seemed to feel at ease with these folks, probably because they didn't seem afraid of her or put her in a muzzle, which she hates. When she needed to be restrained to get her nails cut like the big scared baby she is, the vet and the vet techs remained gentle and calm. They even called the next day to follow up, since the visit was for a painfully splintered toenail that had been making my dog limp and walk slow, and gave me advice on getting her to take her antibiotics. Overall, I think their prices are very very reasonable. The cost of the office visit seems about average and is a really good deal because they don't foist unnecessary services onto you and because they're so good with pets and their people. They explain things very well, take time to answer your questions and listen to your concerns. They definitely go above and beyond. There is not a better vet in the area. They are the best. They took wonderful care of my cats. With my last cat, the doctor would call at night to check on my cat. They treated him like one of their own. They teared up with me the day I had to put my baby down. I have been taking my two cats here for awhile, and I will not go anywhere else. The staff is always friendly, and the doctors actually take the time to check over and talk about your pets with patience, knowledge, and care. This office is also affordable. Definitely try it out if you live in the area! I can’t say enough great things about Dr. Devon Horne and her team at Clintonville Animal Hospital. When my dog was sick, they got me in right away and Dr. Horne was so sweet with my dog, making her feel comfortable and less scared and she spent time explaining to me her plan for testing and treatment and answered any questions that I had. I will definitely be bringing all of my fur-family to this practice for years to come.